Quite easy to set up. The drawback was that it was harder to get the vertical upright at 90 degrees. It seems to have a tendency to lean forward. Clamping a bike in position is quite easy and quick. 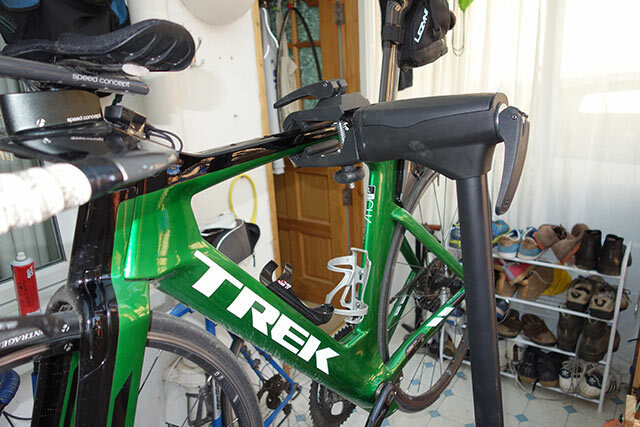 A big quick release lever to hold bike in place. It can also be rotated to clamp by the seat post too. The tendency to learn forward. The first job I bought the workstand for was removing a stubborn crank so that I could swap my power meter from road bike to TT bike. I hoped a workstand would give the additional stability to be able to get the crank off. I had already bought some new expensive allen keys because I was unable to unlock. However, this job was a disappointment. When you’re putting maximum force on removing crank, the stand is not stable, but moves. In the end I had to take bikes to Beeline and they swapped the power meters. The second job was adjusting gears. With my new 11 speed TT bike, this has become more frequent. The hub of the training wheel is in different place to hub of disc-wheel. When I swap wheels, I have to adjust the gears – which is a bit of a pain. Fortunately the Di2 groupset is quite a nice piece of equipment to adjust. Put it in adjust mode and make fine adjustments until the gears work smoothly. I’ve always struggled to satisfactorily adjust gears on mechanical gears, but it’s one job you really want to be able to do. The Workstand does make it a lot easier. In fact once you’ve used a workstand to adjust gears, you think how on earth did I mange before? 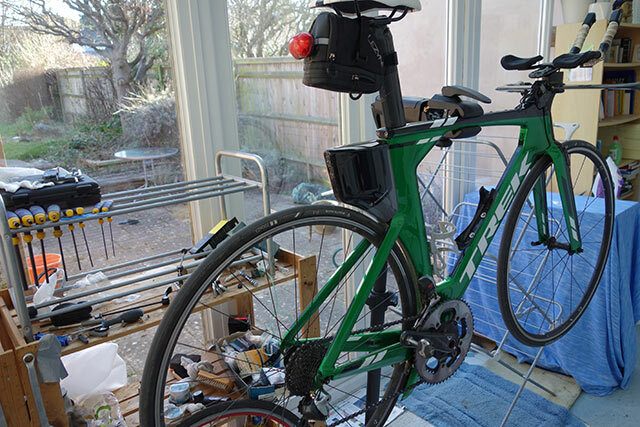 – No wonder I was no good at bike maintenance; it’s a real handicap not having a workstand. Another thing worth bearing in mind, is that it makes bike maintenance more enjoyable. Rather than leaning over and getting a bad back, the bike is where it should be, making it easier and more satisfying to work with. I’ve never used it for cleaning a bike. I find I can give bike a good clean without using stand, so it’s no point getting it out. 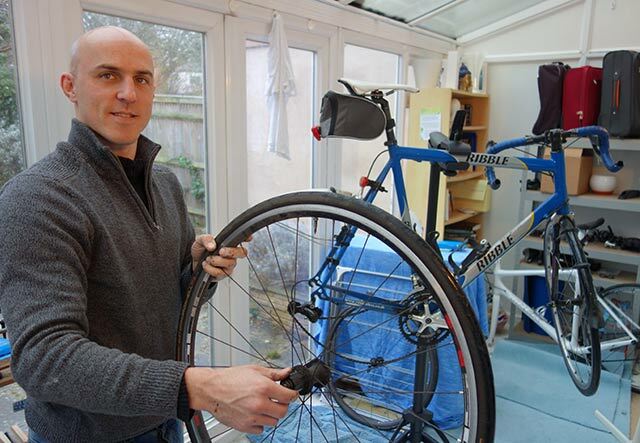 In past few weeks, I’ve had my mobile bike mechanic ‘Andy Sherwood’ come round and do maintenance on different bikes. He’s used my workstand far more than me. Also as a bike mechanic he’s used some good quality workstands over the years. He was generally impressed with the stand, saying it was good value; he was able to do quite a lot of jobs using it. His opinion is worth more than mine. For me, I am really reviewing workstands in general. I have nothing to compare it against. Easy to use, quick to set up. Folds up small, which is a boon for people short of space. It does have a feeling of bendiness. It is not rock solid for really hard adjustments. I’m glad I bought it. In fact, I wish I had bought a workstand earlier. 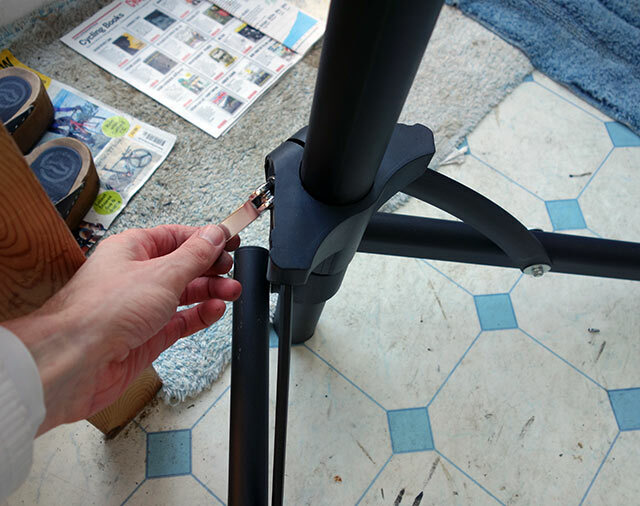 Bear in mind, this is my first workstand so for me – it is a question of reviewing workstands in general. 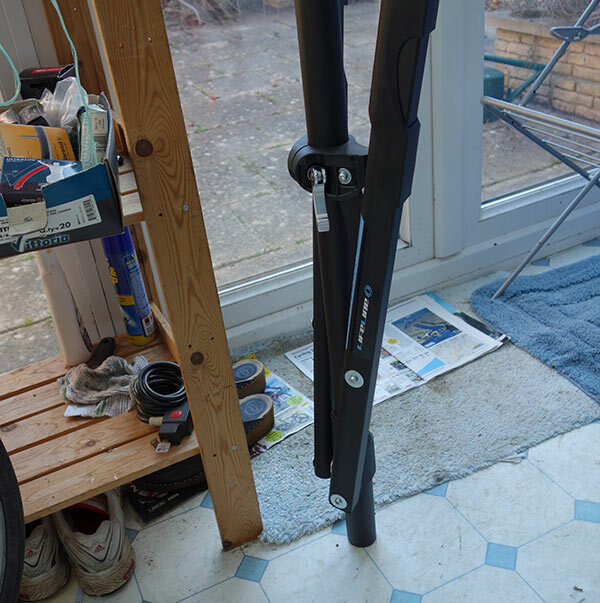 Yes, they are worth buying for even amateur bike mechanics like me. Great review, thanks! May I also say that Trek bike is… beautiful!